This is a rectangular flange Pepsi-Cola porcelain sign. This particular Pepsi-Cola sign is blue and white with red and white text. 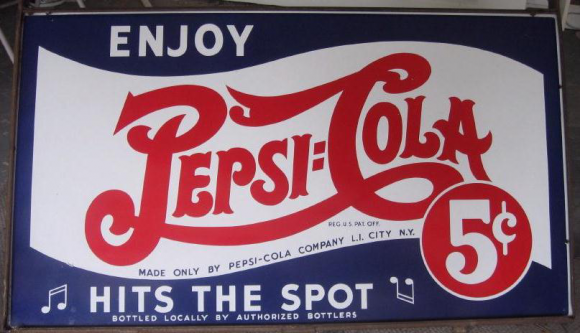 It reads, “Enjoy Pepsi-Cola, Made Only By Pepsi-Cola Company, L.I. City N.Y., Hits The Spot, Bottled Locally By Authorized Bottlers, 5 Cents” and features two white music notes at the bottom of the sign.